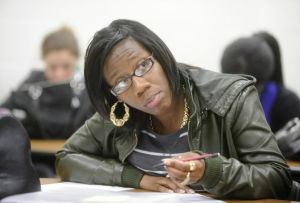 Lakhana Carter listens in one of her favorite classes, “Principles of Marketing,” at Forsyth Technical Community College. Carter, who grew up in the foster care system, is getting her life on track with the help of the “Youth in Transition” program. At 24, Lakhana Carter is just beginning to figure out how to be an adult. She is scheduled to graduate from Forsyth Technical Community College with an associate’s degree in applied science, works as a cashier at Sam’s Club and has lived in her one-bedroom apartment off University Parkway the past four years. But the road to get there wasn’t an easy one. Carter spent much of her early life in foster care; she and her two younger sisters were removed from their mother’s home because of neglect when Carter was about 12. Her older brother ended up in a group home. By the time Carter had gotten to high school, she and her younger sisters had been adopted by a relative. But during her second semester at Forsyth Tech, that relative put her out of the house. Suddenly, Carter was on her own and without many of the life skills — like balancing a checkbook — that young people from more stable family environments develop. Carter said she had to learn how to save money, pay her bills and get the financial aid to finish her education. For a short time, she stayed with friends before settling into the apartment she lives in now. Because she is on her own, she didn’t qualify for a certain type of financial aid, which kept her from returning to Forsyth Tech until this past January. Carter was among the more than 26,000 people in the nation annually who age out of foster care at age 18 and who don’t have the strong family support and resources to help them navigate early adulthood. Experts say that the number of young people aging out of foster care has steadily increased. Since 1999, more than 230,000 young people have left foster care without permanent family connections, according to the Jim Casey Youth Opportunities Initiative, a national organization that helps former foster care children. • More than one in five will become homeless after age 18. • 58 percent graduate high school by age 19, compared to 87 percent of all 19 year olds. • 71 percent of young women become pregnant by 21, resulting in higher rates of unemployment, criminal convictions, public assistance and involvement in the child welfare system. • Fewer than 3 percent will obtain a college degree by age 25, compared to 28 percent of all 25 year olds. Carter has seemingly beaten the odds, and she credits a local initiative called Youth in Transition, which was started about two years ago through the efforts of several community organizations, including the Winston-Salem Foundation and the Forsyth County Department of Social Services. Goodwill Industries is the lead agency, and the initiative is financed through more than $1 million in grants from the Duke Endowment and Kate B. Reynolds Charitable Trust. There are more than 13,000 children in North Carolina in the foster care system, and every year about 500 of them age out of the system. As of Sept. 30, 2012, nearly 400,000 children were in foster care in the United States, according to federal data. Forsyth County had about 160 children in foster care at the end of October, and 11 young people in the county aged out of the system during the fiscal year that ended June 30, 2013. Experts don’t dispute that the numbers are small but argue that doesn’t make it any less of a problem because those young people touch all aspects of a community. Joe Raymond, the director of the Forsyth County Department of Social Services, said many people think it’s something his agency should handle, forgetting that it’s a community issue. “DSS can’t do this by themselves,” he said. Raymond said these young people are not just dealing with the trauma of the abuse or neglect they may have suffered in the homes from which they were removed; they’re also dealing with the trauma of being removed. Mark Testa, a professor of social work at UNC Chapel Hill, said the suffering doesn’t just go away. “The scars simply don’t disappear once you turn 18,” he said. Testa said that the foster care system isn’t equipped to deal with older young people. “Our foster care system was established over 120 years ago when it wasn’t unexpected that a young person would land a job at age 16, marry at age 20 and start a family soon,” he said. Society has changed in such a way that the age of maturity has extended beyond the teenage years, Testa said. Now the foster care system is starting to follow the same timeline, as well as communities, Testa said. And the issue has gotten renewed attention, experts said. Raymond said that even before he came to Forsyth County, he knew that he wanted to tackle the issue of young people aging out of the foster care system. He said he knew it was a solvable problem because the population is small. The challenge, he said, was convincing community leaders that this was a community problem and not a DSS problem. “Everybody was waiting for DSS to do (something),” he said. Forsyth County DSS has limited services it provides, such as the LINKS program. Young adults who turn 18 can sign an agreement to receive housing and other services as long as they stay in school. But Raymond said many young people don’t sign the agreement because they’re anxious to get out of the foster care system. Some have a natural need to reconnect with their biological parents, and for some, that works out. For others, it doesn’t, Raymond said. Raymond said he contacted Scott Wierman, president of the Winston-Salem Foundation, about the issue. Michael Clements, the foundation’s vice-president of community, then became involved. Clements said one thing that was critical was listening to those who had been in the foster care system. “The fact of the matter is that they are in the best position to tell us what the major issues are,” he said. Also critical was a partnership with the Jim Casey Youth Opportunities Initiative, which is working with 16 states on the issue. The Winston-Salem Foundation and Reynolds Charitable Trust provided seed money. Then in 2011, Duke Endowment and Reynolds Charitable Trust provided more than a $1 million in grants to start Youth in Transition. Alex Hudson, the lead coordinator for Youth in Transition, said that about 50 young adults participate in the program. Most are between 18 and 24, he said. The Jim Casey Youth Opportunities Initiative offers technical assistance. Youth in Transition is the only initiative of its kind in North Carolina, but Squibb said she is working with the state and other communities to expand the initiative. Youth in Transition also has a youth leadership board. The Winston-Salem Foundation’s Clements said the program has worked well but the key is what happens to young people five years or 10 years down the road. That will show the long-term effectiveness of the program, he said. One of the goals is to find ways to provide housing for some of the young people, Clements said. Youth in Transition is one of several partners supporting a project called the Commons, a housing community that’s being planned on 16 acres at the intersection of Reidsville and Old Greensboro roads. The N.C. Housing Foundation will own and operate the community. A $4 million capital campaign was announced at the end of October. Hudson said he has been working with Forsyth County officials to buy property to provide housing for youth in the initiative, but that plan is currently on hold. In Carter’s apartment, her high school diploma from Carver High School sits on the living room table. By the television are two certificates she received from Forsyth Tech for outpatient billing and medical receptionist. Carter’s first 24 years of life have been chaos, but displayed in her apartment are her achievements. And she’s not finished. Carter said she wants to further her education and earn a bachelor’s degree. Her short-term goal is to work in either a doctor’s office or with a medical-insurance company. Eventually, she wants to run a hospital, she said. She also wants to travel to such countries as China and Canada and the continent of Africa. Carter said she wants to help people just like Youth in Transition helped her. Through Youth in Transition, she said she has gained confidence. And more than anything, she said she has learned not to give up.